It’s like stepping back forty years. Those family holidays in France back in the early 70’s. 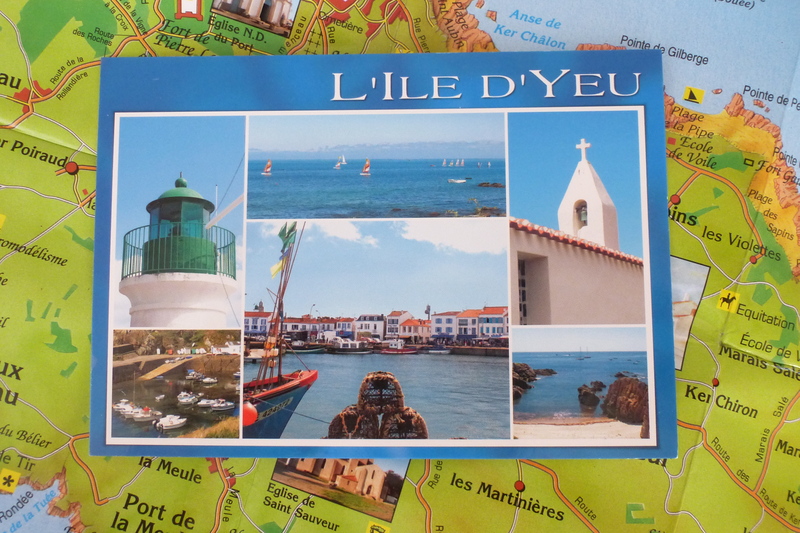 Welcome to Ile d’Yeu a traditional island for a traditional French style family holiday. There are still parts of France that remain untouched by the great British ex-pat invasion either because they are inaccessible or simply because the Brits have never heard of them. 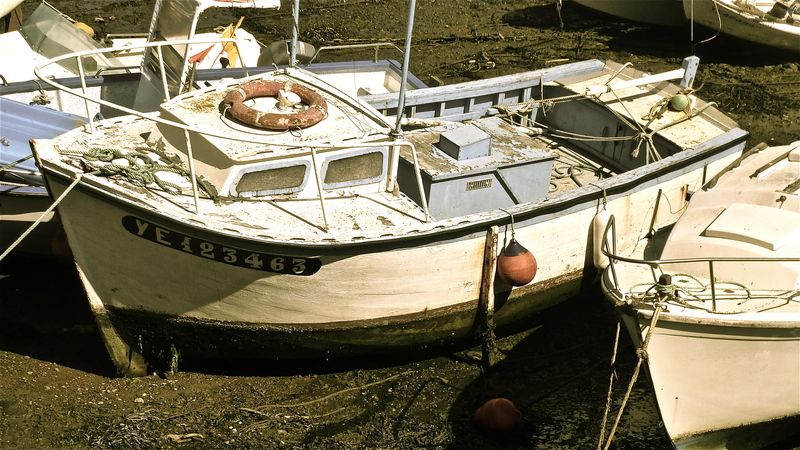 One such place is Ile d’Yeu – a small Island just fifteen miles or so off the French Atlantic coast. Ile d’Yeu is (according to one website) 17 kilometres long and 4 kilometres wide, though having cycled around it for the best part of a week , I can assure you that it feels much bigger. The Island has a population of 4700 people (according to the last census) though the population easily doubles and triples in the summer vacation season. 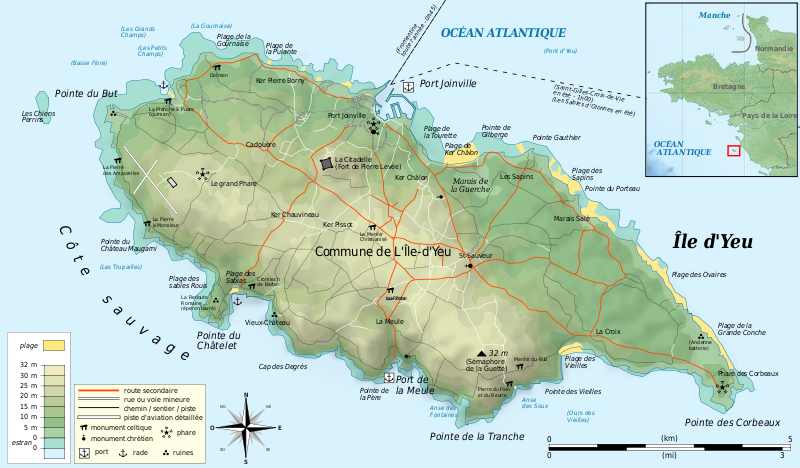 Ile d’Yeu has mile upon mile of sandy beaches on the French side of the coast and long stretches of wild, craggy cliffs on the Atlantic side. It is all quaint hamlets of squat, whitewashed blue- shuttered fishermen’s’ cottages, all with neat gardens and wooden gates. There are large expanses of pine forest along the coast and in the hinterland there are woods of young oak trees that grow well in the sandy soil. The main town, Port Joinville is a charming, picture postcard fishing port with a lively market selling crepes, and freshly caught tuna and lobster. There are also countless cafés, art galleries, craft shops and restaurants. The Island counts two large supermarkets, one cinema, two public libraries and even a home delivery pizza service, there are however no Chinese restaurants, no kebab restaurants, no discothèques or nightclubs and most life grinds to a halt around 7pm when the shops close, although some bars are open until around 11pm – one thing’s for sure, you won’t come to Ile d’Yeu for the nightlife. 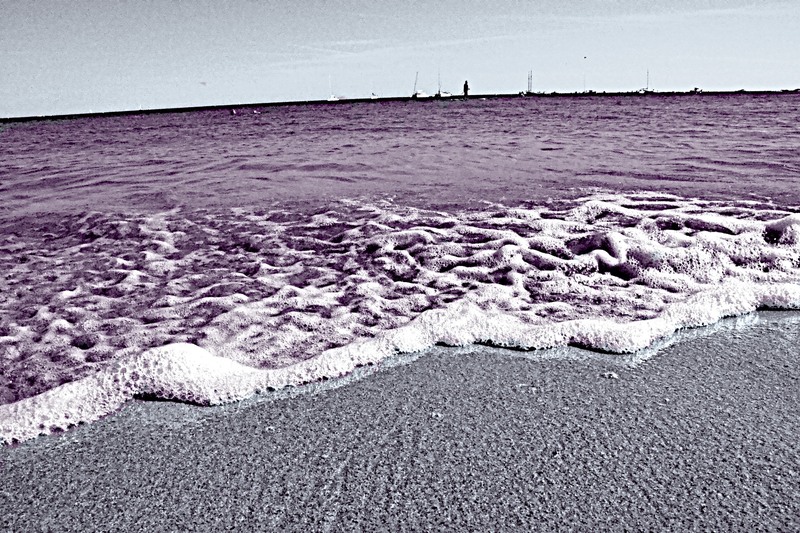 This is a place to sit on the beach, and read all those books you haven’t read all year. It is a place to write, paint, contemplate the ways of the world and catch up on your sleep. 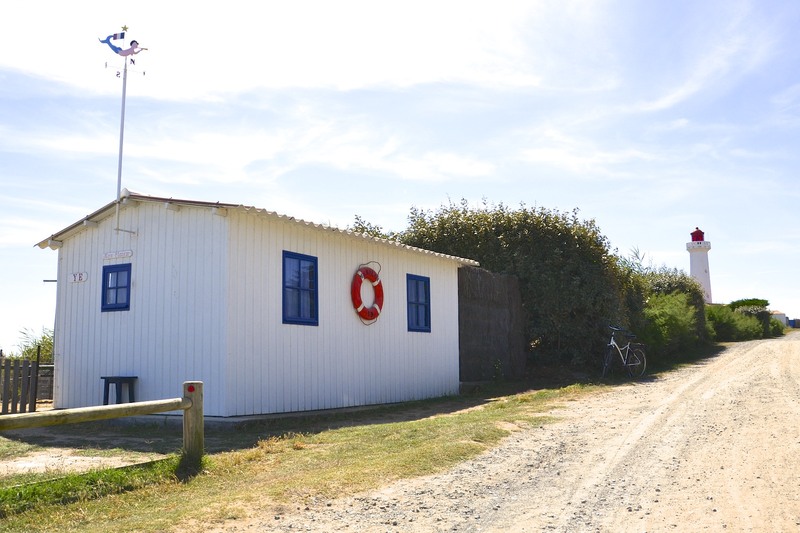 It is a place for a traditional family holiday of building sandcastles, hopping around rock pools looking for crabs and shellfish or quite simply sitting under your parasol, knitting and chatting with the neighbours. You come here for peace and quiet. 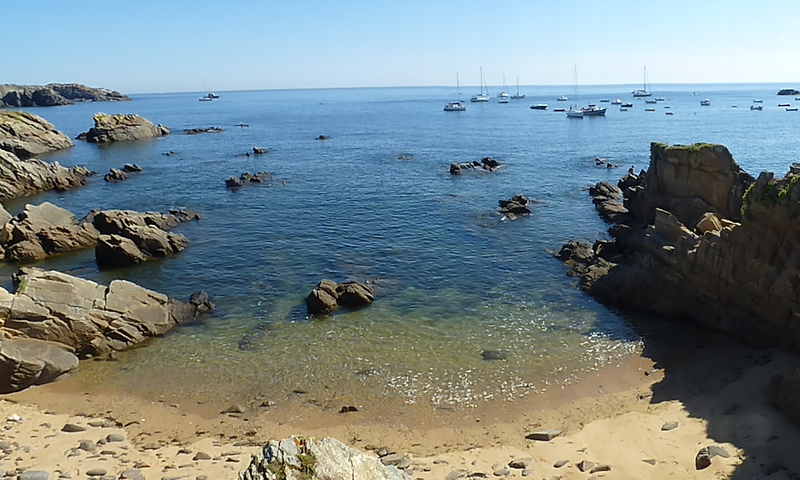 A week on Ile d’Yeu will leave you fit and healthy. The best way round is by bike, and though cars are not banned, the prohibitive 560 Euro return fare to get you car across from the Mainland is enough to dissuade even the most ardent of motorists. Most of the islanders have cars, but parking places are scarce, so if you want to get around, it is pure pedal power. Needless to say, one of the best ways to make money on Ile d’Yeu is running a bike hire business. 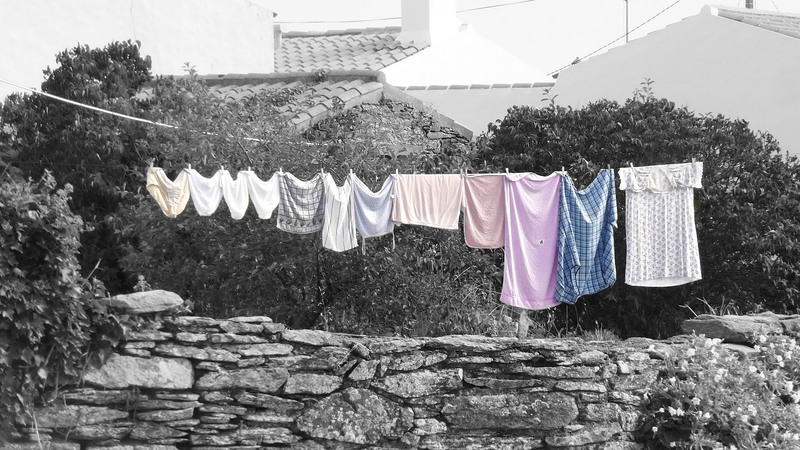 This is a very Franco-French family destination – families who have holiday homes on the Island and have been coming here for generations. For a whole week, I have only heard one English accent – no Germans or Dutch. If the Dutch knew about this place, they would be here in their droves, cycling everywhere from dawn ‘til dusk, as is their wont when they go on holiday. I’ve lost count of how many times I have nearly been mown down by long lines of loud, blonde Dutch cyclists on previous French seaside holidays. I suppose what deters the Dutch and the Brits from coming is not so much the inaccessibility of the place; it is probably the fact that you can’t really bring the car. When the ferries arrive from the Mainland, they disgorge hundreds of foot passengers all carrying heavy rucksacks or towing suitcases behind them. This might deter northern European visitors who seem to bring their entire lives with them on holiday. You can only bring what you can carry. Just a cursory glance at the one and only campsite on the Island reveals something strange – not a caravan in sight. And thanks to the official « discouragement » of tourist motor vehicles, there are no camper vans (recreational vehicles) to clog up the roads. Now, you might have though, that this being a holiday Island with miles of country road, the locals would al be tearing round the place in SUVs – well, surprisingly not. 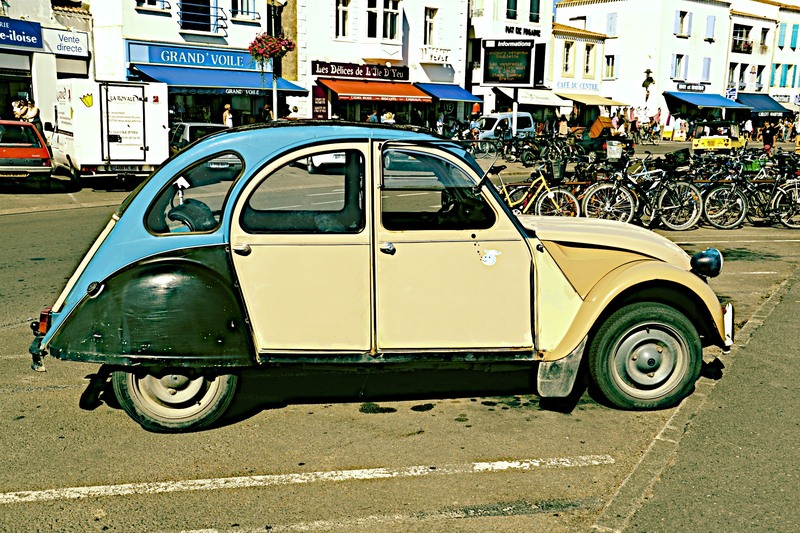 The most popular mode of motor transport is the good old 2CV and the Citroen Mehari – a kind of plastic utility vehicle made by Citroen in the early 70’s. 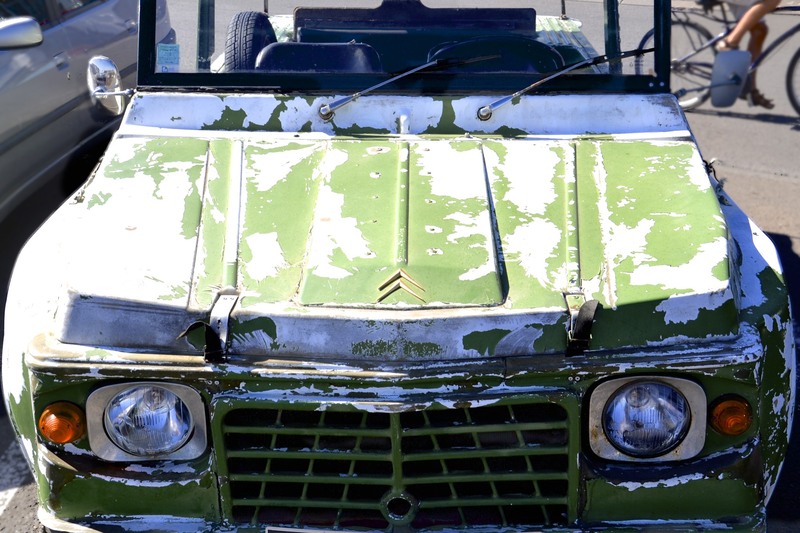 Originally designed as a general-purpose vehicle for the French army and the Gendarmerie, the Mehari proved totally unadapted for military use. It was lousy as an off-roader, and far too uncomfortable to travel any distance on the road. 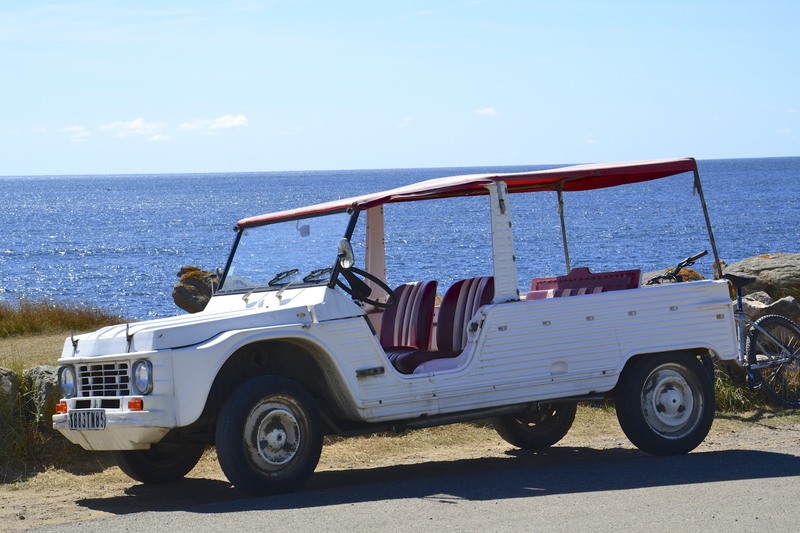 For travelling in-between beaches with a couple of surfboards in the back though, the Mehari is fantastic, and so, since the mid eighties it has been adopted as essential and even stylish beach transport. I suppose the Mehari is a French equivalent of the Mini Moke. 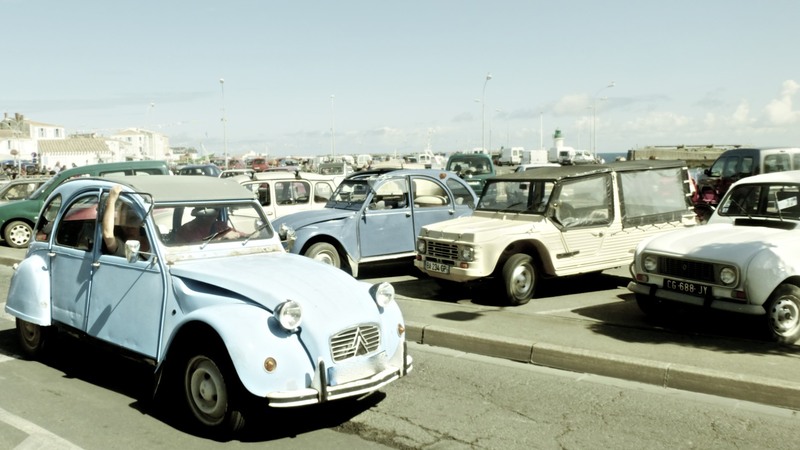 Ile d’Yeu is alive with 2CV’s and Meharis – the other popular car is the good old Renault 4. Now there are those who have fully-restored 2CVs and Meharis – at current prices, a fully restored version of either model can set you back as much as 10,000 Euros – the rule in Ile d’Yeu though seems to be, the more beat up, the better. The same is true of bicycles and even the holidaymakers themselves. 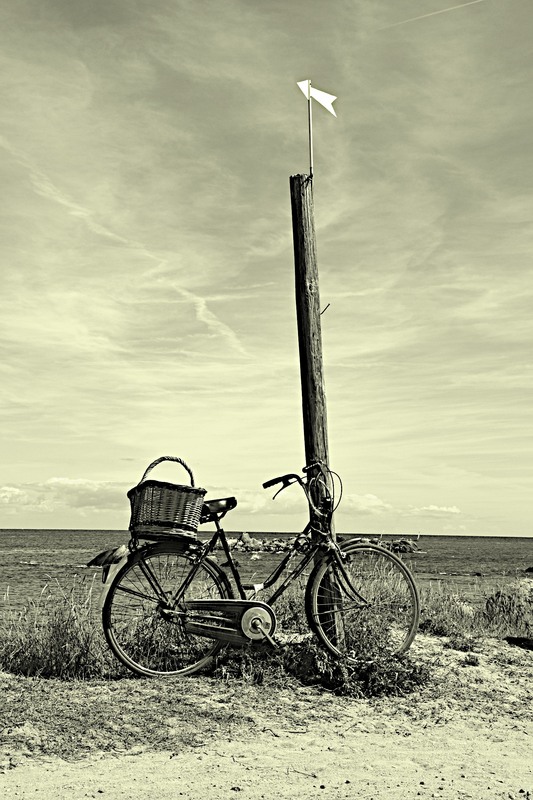 Ultimate bicycle is an old boneshaker – something that Grandpa might have ridden. In sartorial terms – faded, slightly torn shorts, a baggy, slightly crumpled cotton shirt, a well-worn, distressed panama and espadrilles. For the gents, holiday designer stubble is also very much in vogue. The holidaymakers here aren’t poor though, it is all very middle to upper class – just take a look at the grocery box on the back of the bike – not just any old plastic crate, but generally a well-worn wooden wine case from the Bordeaux region – St Emillion or Château Margaux – and the riders fill their boxes with organic veg bought from the morning quayside market down on the port. Ah yes, take a closer look and you’ll see that Ile d’Yeu is a « chic » place – boho or bobo chic with a traditional catholic tinge. Well, France’s Atlantic seaboard is a very Catholic place. This was where the locals held out against the revolution. Before Napoleon Bonaparte could launch his campaigns across Europe, he had to pacify numerous uprisings in the Vendée and Brittany regions along the Atlantic coast. The region is still quite pious. In some restaurants, you might still find locals who cut the sign of the cross in their bread before they serve it. I suppose, for an Englishman, there is only ne thing missing on this Island – a decent Fish and Chip shop. Well, after a hard day’s cycling, when you hit the main town, there is the smell of fish in the air – fresh fish, or fish being lovingly grilled on a BBQ or in the kitchens of some restaurant – all that’s missing is the smell of batter and vinegar. I’ve been here for nearly a week, and despite the charms of the place, I’m dreaming of fish and chips. 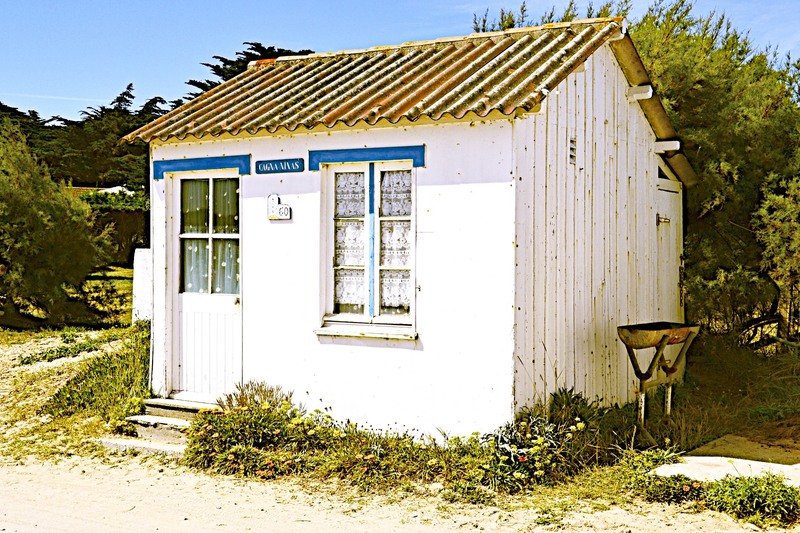 Posted in France, Holidays, Motoring, TRAVEL and tagged holidays, Ike d'Yeu, islands, tradition, Vendee. Bookmark the permalink.